Testing the Micro-Submersible Lake Exploration Device used to access Lake Whillans. Unique environments buried so deep below the surface of the Antarctic Ice Sheet that sunlight cannot penetrate to them, giving the the potential to be home to new species previously unknown to science, the hundreds of subglacial lakes that have been discovered are ripe with new opportunities for scientific discovery for microbiologists, geochemists and glaciologists. While many have been discovered, only a handful are in the process of being investigated: Lake Vostok, buried more than 3.7 km below the surface of the ice sheet near Russia's Vostok Station; Lake Ellsworth, 3 km down from the surface in West Antarctica, and Lake Whillans, some 800 metres below the ice surface, and approximately 100 km upstream from where Whillans Ice Stream meets the Ross Sea in West Antarctica. So far, scientists have only been able to take samples from two lakes. Russian scientists penetrated Lake Vostok in February 2012, and a consortium of American university researchers penetrated Lake Whillans in January 2013. A British team drilling towards Lake Ellsworth had to abandon their drilling project during the 2012-2013 drilling season. In this first part of a two-part interview, Dr. Mark Skidmore, a biogeochemist at Montana State University responsible for the geochemical analysis of samples taken from Lake Whillans under the WISSARD (Whillans Ice Stream Subglacial Access Research Drilling) project, agreed to give SciencePoles some insight into what is currently known about subglacial lakes and what scientific knowledge/discoveries we can expect to gain by studying them. What do scientists currently know about subglacial lakes in Antarctica? There's evidence that about 360 subglacial lakes exist beneath the Antarctic Ice Sheet. They've been found primarily by using radio echo-sounding techniques (also called ice-penetrating radar), which can detect them through the reflections the radar signal gives as it bounces off the ice-bed interface and comes back to the surface through the ice. The water in the subglacial lakes has different reflection properties relative to bedrock and frozen sediments, making them easy to identify. Although about 360 subglacial lakes have been identified in Antarctica, this is unlikely to be an exhaustive inventory of them. There are large areas where there's not a lot of radio echo sounding coverage, so it's likely there are more lakes to be discovered. Despite knowing there are a large number of them, in terms of knowing actually what's in subglacial lakes from a chemical or microbial standpoint, there's only been one sample from the continent that's been taken to date, prior to the WISSARD project. That earlier sample was not a direct sample of subglacial lake water, but accreted ice, which is ice that forms when water from the subglacial lake freezes onto the bottom of the ice sheet. This accreted ice was from an ice core above Lake Vostok in East Antarctica drilled by the Russians in the late 1990’s (the Russians restarted their drilling and sampling of the accreted ice over the past 4-5 years). There's been a lot of geochemical and microbial analysis of that accreted ice; but that's not actually the lake water itself. It's frozen lake water, so there will have been some geochemical and microbiological changes relative to the lake water that occur during freezing. Why is it important to study subglacial lakes? They've got a number of different aspects that make them important. They're important from a hydrological point of view, in terms of their connection to the hydrological system at the base of the Antarctic Ice Sheet. Water at the base of an ice mass lubricates it and helps it to flow. So if you have areas where water is collecting in lakes, it's important to understand how that links to the rest of the hydrological system. If a subglacial lake drains, it's potentially putting a large amount of water into the hydrological system at a given point, and this can have an impact on how the ice in the ice sheet flows.If you can get a sediment record from the lake floor, it can be used to help reconstruct past ice sheet conditions and give you some idea about how the ice was flowing in the past and what conditions were like at the base of the ice. From a geochemical and microbial standpoint, subglacial lakes represent an unknown ecosystem and may harbour unique organisms. There is no sunlight as an energy source, so the bacteria in these lakes either gain energy from organic material that flows into the lake, or from other sources such as minerals in the subglacial sediments, including pyrite (FeS2). If the latter is true, as has been argued for other subglacial systems, beneath both valley glaciers and ice streams, then this is important for our understanding of geochemical cycling of these elements at a continental scale. It may also have implications for the search for extraterrestrial life, as microbial life on other planets would likely use mineral energy sources. How does one get a sediment record in a subglacial lake? Sediment collects on the floor of subglacial lakes, just like it does in surface lakes, due to the settling of sediment particles from the water column via gravity. 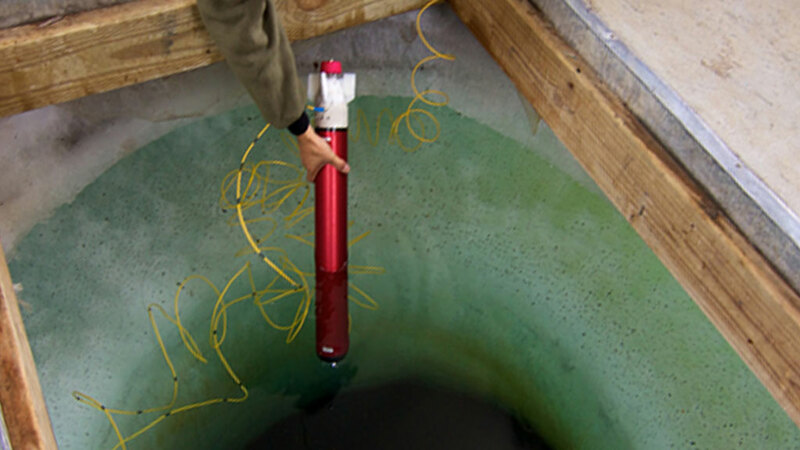 We can collect sediment using a coring device. At Lake Whillans, we were able to obtain 60 cm cores. Why have certain subglacial lakes been singled out as a priority for researchers to investigate? Does it have to do with their size or more to do with logistical reasons (being located close to an already existing research station, for example)? Logistical factors play a role to a certain degree. Proximity to a research station would certainly be the case for Lake Vostok. The Russians began drilling though the ice sheet at Vostok originally to collect an ice core for a climate record. It was only when they got down 3,500 metres or so and started seeing accreted ice from the lake that they decided to investigate the subglacial lake as well. So this makes sense from a logistical point of view. It also happens that Vostok is the largest subglacial lake known, so that adds scientific interest. As for Lake Ellsworth, it is my understanding that it was chosen to investigate the presence, origin, evolution, and maintenance of life in an Antarctic subglacial lake and the paleoenvironment and glacial history of the West Antarctic Ice Sheet by recovering a sedimentary record from the lake floor. There’s additional information on the Lake Ellsworth project on their website. Is there any sort of international coordination when it comes to deciding which lakes to research or does each country simply just work on its own programme alone? That's a good question. There was a workshop in Baltimore, Maryland in the US in 2010 that I participated in. It included people from the three main drilling projects, from the US, the UK and Russia. We discussed what each project was planning to do. But each individual country has been working on its own specific plans for their own lake drilling project. Nonetheless, there has been a good exchange of information between the three drilling projects. John Priscu, who's the chief scientist on the Lake Whillans drilling project, is regularly in contact with the chief scientists in the Russian and UK drilling teams. Also, we had scientists from the UK team visit us in the US to have a look at the filtration systems we use (we have to clean the water used in the hot water drills to minimize the potential for contaminating the water in the subglacial lake). We also had a Russian scientist, Irina Alekhina, participate as an observer when we tested our drilling equipment in McMurdo Ice Shelf this past season. And then you have Carlo Barbante, an Italian geochemist. He's worked on the trace element chemistry of the accreted ice taken from Lake Vostok. He joined our research team on the Lake Whillans project to make similar trace element measurements on the subglacial waters. Did you have any particular logistical challenges to overcome during the project? There are lots of challenges at all stages of the process. There's getting the drilling equipment and scientific laboratories out to the field site via a 600 mile (1,000 km) traverse across the ice sheet. Then there's ensuring safe operations of the drill and the scientific tools, and then actually recovering samples with those tools. At the end of the day, the research team and support staff have to overcome these challenges for the project to be a success. Did you have to worry about contaminating the samples you took from Lake Whillans? We took every precaution to ensure clean access drilling. We used a hot water drill to penetrate the ice sheet down to the lake. The water was sourced from melting the snow from the ice sheet surface. We used no drilling fluid such as kerosene. The water used in the drill was put through a multiple stage cleaning process. The melted snow first passed through 2 and 0.2 micron (μm) filters successively to take out particles and bacteria. Once through these filters, the water was treated by two sets of UV filters to kill any remaining microbes. Then the water was heated to between 80 to 90°C, effectively pasteurizing it. Everything was well tested before we took it out to Lake Whillans. We first tested the filtration system at Montana State University. We then tested all the equipment on the McMurdo Ice Shelf next to the US base, McMurdo Station, in December 2012. We also took precautions with sampling tools. Before they went down the borehole, we sprayed them with hydrogen peroxide to disinfect them. We also placed a large UV collar at the top of the borehole that closed around the cable or the drill hose after being put down the hole to UV sterilize them as they were lowered down. After we collected the samples, they were split under a HEPA-filtered bench in the field lab to ensure clean conditions, for both immediate analysis and storage for subsequent laboratory analysis. No one can say you didn't take every possible precaution! In planning this, it was key to demonstrate that at every step of the process we took every possible precaution to make sure that for any organisms we identify in the samples we collected, we want to be able to say with certainty that they weren't introduced during the drilling and sampling process. There have been reports that you have found living organisms in the water sampled from Lake Whillans. Is there anything you can tell us about these organisms at this time or will it be a while before you are able to say anything about the life you've found? It's probably going to be a while before we have a comprehensive data set on the lake microbiology. Once it is collated we will publish that data in a peer-reviewed journal. Dr. Mark Skidmore is a biogeochemist at Montana State University responsible for the geochemical analysis of samples taken from Lake Whillans under the WISSARD (Whillans Ice Stream Subglacial Access Research Drilling) project.